Anchor announced that they have made changes that will make it easier to edit audio on Anchor. They were getting a lot of feedback from people asking why they cannot edit audio before adding it to their station. Interestingly, the solution to this problem came from something Anchor recently updated. When we introduced Anchor Videos features a few weeks back, we started automatically transcribing audio so our users could easily convert their segments into something digestible and sharable on social media. It occurred to us that this same transcription could be leveraged to design the simple, intuitive, mobile-first experience we had been looking for. 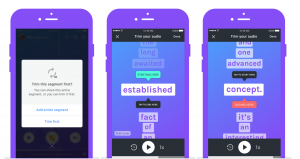 In short, Anchor noticed that when people are editing audio, they are basically deciding which words and phrases they wanted to include – and which ones to exclude. This process was already available for Anchor users who wanted to edit their Anchor Videos. Now, audio on Anchor can be edited the same way. You can now edit call-ins, and other people’s segments before adding them to your own station or podcast. Before adding your audio, choose a starting word and an ending word, and you’re done. Anchor will discard the rest of the audio and just add the part you want your listeners to hear. Anchor sees this as a first step towards making audio easier to edit on mobile. They will be adding more features in the near future. Their philosophy is: audio creation on Anchor will always focus on intuitiveness, and the actual content you care about – not a technical representation of the audio file that happens to contain it.